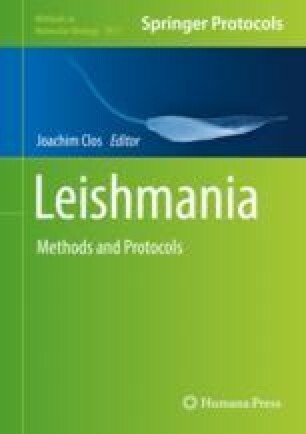 The study of in vitro infections is essential to evaluate distinct aspects of Leishmania biology and also invaluable for more meaningful in vitro screening of promising chemical entities. Macrophage-like cells lines from different origins are amenable to Leishmania infection. Cell lines due to their stability and standardization potential are highly valued for their capacity to support reproducible infections and consistent data. In fact, these cells have been a mainstay of leishmaniasis research for more than 40 years. In this context, the human monocytic THP-1 cell line is commonly used as it can be differentiated with phorbol-12myristate-13-acetate (PMA) into macrophages that are susceptible to Leishmania infection. In this section, we will describe generalities concerning the use of cell lines for in vitro Leishmania infection using THP-1 derived macrophages and Leishmania infantum axenic amastigotes expressing luciferase associated to preclinical drug screening as example. This work was supported by funds from the Fundação para a Ciência e Tecnologia (FCT)/Ministério da Educação e Ciência (MEC) cofunded by the European Regional Development Fund (FEDER) under the Partnership agreement PT2020, through the Research Unit No.4293. This work also received funds from project POCI-01-0145-FEDER-031013 financed by Portugal 2020, under the Programa Operacional Competitividade e Internacionalização (COMPETE 2020) and Norte-01-0145-FEDER-000012—Structured program on bioengineered therapies for infectious diseases and tissue regeneration, supported by Norte Portugal Regional Operational Programme (NORTE 2020), under the PORTUGAL 2020 Partnership Agreement, through the FEDER. J.T. is an Investigator FCT funded by National funds through FCT and cofunded through European Social Fund within the Human Potential Operating Programme. WHO (2017) Leishmaniasis. http://www.who.int/leishmaniasis/en/. Accessed 30 Nov 2017. ATCC THP1(ATCC TIB-202). https://www.lgcstandards-atcc.org/products/all/TIB-202.aspx. Accessed 4 Jan 2018.